I keep several map books in my car for the different states that I hike and backpack in, called Gazetteers. They’re published by a company called Delorme (recently acquired by Garmin) and contain detailed maps of each state including all of the paved and unpaved roads, seasonal roads, gated fire roads, mountains, ponds, rivers, streams, and campgrounds in the state, as well as a host of other recreation-specific information. Gazetteers are absolutely indispensable for planning backcountry trips and contain a lot of the information that is left out of activity-specific maps intended for hiking, backpacking, skiing, and mountain biking. Each state is broken out into a numbered grid, each with a full page topographic map. The scale in the Maine Gazetteer is 1:135,000, which is a good scale for identifying roads and natural features. The Maine Gazetteer contains 70 maps. I use Gazetteers to for planning on almost every trip I take into the backcountry. They’re so useful for finding remote trail heads, trout streams, hiking trails, primitive campsites, and old jeep trails, you name it, because they integrate so much information into a single uniform overview that I can’t get anywhere else. It’s a treasure trove of outdoor recreation information that’s far easier to browse than anything online. Here are a few ways that you could use the Maine Gazetteer to plan trips that’d be hard to plan any other way. Theses are representative of the types of questions you can answer with any of the state-specific Gazetteers that Delorme publishes. Meeting an Appalachian Trail thru-hiker in the 100 mile Wilderness at the southern end of Nahmakanta Lake, which has a nice beach. The Gazetteer shows you which roads you’d need to drive to get there and information about road quality or gated access that you can’t find on most online maps. The closest roads to a Maine 4000 footer like Mt Redington, so you only have to bushwhack a short distance to get to the summit. While you can find turn by turn directions online, there’s nothing like having a map that you can follow, especially if you want to approach the peak from an original direction and not one followed by “the herd.” Again, the information about road quality, including indications of impassable, washed out roads, is essential for planning. A map showing all of the trailerable boat ramps, and maintained or primitive campsites along the shore of mighty Chesuncook Lake. That’s just scratching the surface. Whatever your pleasure: hiking, camping, boating, fishing, hunting, kayaking, photography, or mountain biking, Delorme Gazetteers are your gateway to backcountry exploration off the grid. Disclosure: I purchased all of these products with my own funds. Editor's note: Help support this site by making your next gear purchase through one of the links above. Click a link, buy what you need, and the seller will contribute a portion of the purchase price to support SectionHiker's unsponsored gear reviews, articles, and hiking guides. I never leave home without it. Too mant times I’ve driven by some road going to a remote trailhead and the Gazateer got me found again. I thought I was the only one who still treasured his collection of these books. I was just a teen when the New Hampshire one was first printed and I remember family trips where I would follow along on my map as we drove. Nearly every building is on the map, so I could plot our exact position very accurately. In a time well before GPS, it was simple to navigate where I wanted to go. Sure, some maps would show Jefferson Notch Road, but the Atlas opened a whole new world of little know ‘roads’ that someone with a Jeep could utilize. And of course, I took full advantage of that power. Oh no – I know lots of people who have these in their cars and trucks. The problem with maps these days is that they’re very activity specific. 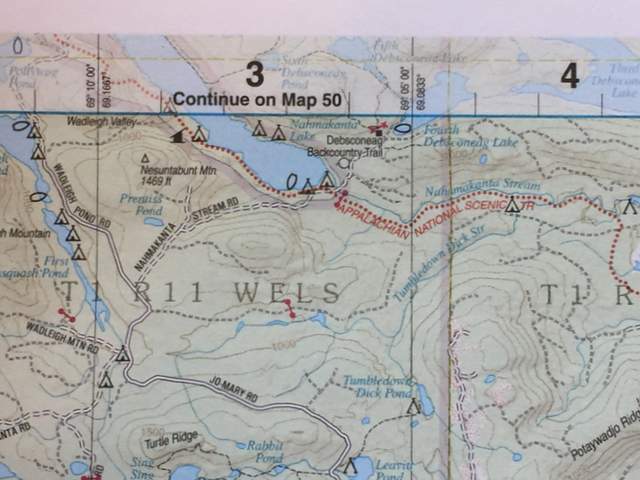 For example, many hiking maps only show hiking trails and nothing else. Gazetteers provides a unified, multi-sport view of recreational options including unpaved road conditions which makes them much more valuable to outdoor adventurers. But I’m preaching to the choir. If you have a jeep, you know exactly what I’m talking about. I stsrted buying one for every state I travel in. I’ve been to 49 states and have The Gazeteer for about half of them. I grew up around topo maps and have file cabinets full of those. I love my GPS apps and topo map layers but the map books are my favorites. DeLorme blew it with the California Gazetteer. They used to have two books, Northern and Southern & Central, both at good resolution. Now they stuff the whole state into one book at lower resolution. Just checked, the new California edition has 1:200,000 maps (1 inch = 3.16 mi) and 300 foot contours. OK, but not as good as the earlier ones. Not just California. I’ve seen newer copies of the books I have and there are quite a few with loss of detail. Maybe it is a state by state thing, but showing little black boxes for various buildings seems to no longer be included. My Maine version (one of the first books they did) has things like fishing spots, remote camping areas and such marked. It was more like the book was assembled by active outdoors people and not just detailed cartographers. Later versions simply don’t have the detail. For example, the Colorado one I have barely lists the major hiking trails Lots of secondary trails are not there. I guess I’ll stick with my 2 volume CA set. Thanks for the update. Click on the hyperlinks in the article. Amazon carries them. They’re usually at every Wal-Mart, Target, REI, and pharmacy I’ve come across. Delorme state atlases are invaluable for finding forest service roads and other dirt roads, eg, roads to put-in/take-out ramps. Looking at reviews on Amazon, there are lots of comments that the newer DeLorme Gazetteers are using a different scale and that the overall map details aren’t what they used to be. Benchmark Road & Recreation Atlases are said to be the better choice now. I just moved to the PNW and need to buy a few of them. Has anyone here compared Delorme with Benchmark lately? Looks like Benchmark doesn’t cover much of the US. I’ll have to get Delorme before Garmin screws it up like everything else they touch. Worst customer service I’ve ever had is Garmin. Freaking worst. I try to stay with the most current edition as we have found that the smaller roads have occasionally changed names. Beware DeLorme was sold to Garmin about a year ago, closing their Yarmouth, Maine retail awesome store . . . and apparently LIMITING the then existing inventory of Gazetteer maps to supply channels . . . you may want to buy now before stock depletion. False alarm. While they closed their map store, they have committed to continuing to publish Gazetteers. i’ve been using Delorme atlases for over 30 years. i mark them up with fishing access and wilderness campsite info. when i finally have to replace one, it takes a whole evening to transfer the notes to the new book. Nh and MA books are stuffed between the front car seats and console for ready reference. Hadn’t heard Garmin bought them – maybe Delorme can help them update their crappy trail data. REI: Save up to 30% in the REI Outlet. Get great deals on last season's gear, clothing, and footwear. MOOSEJAW.COM: Get 30 Percent Back in Moosejaw Reward Dollars with Coupon Code "MJ30". MASSDROP.COM: Support Cottage Backpacking Gear Companies with Huge Discounts on Ultralight Gear from Dutchware, Zpacks, Enlightened Equipment, Fizan, and many more! Shop now! PATAGONIA.COM: FREE Shipping at Patagonia.com on all orders of $75 or more! GOSSAMER GEAR: Shop the Gossamer Gear Mariposa 60 Backpack. #1 Editors Choice Ultralight Pack by Backpacker Magazine. © Copyright 2007-2019, SectionHiker.com and Fells Press LLC. All Rights Reserved. No duplication of photos, maps, or text without permission.